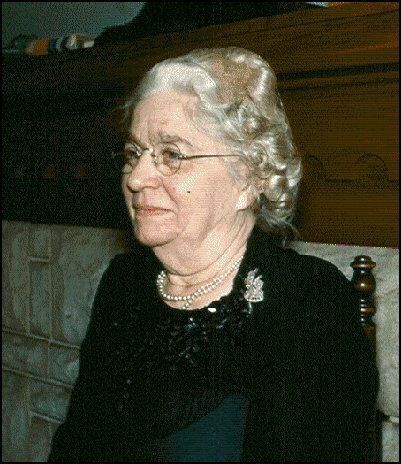 Lulu Lutterman was Edna Foertmeyer Emerson's best friend. 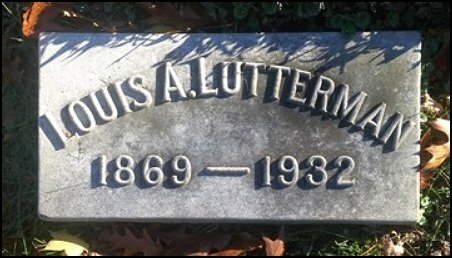 Lulu's husband was a pharmacist named Louis who had a drug store at 1600 Sycamore Street in Cincinnati. The Luttermans lived above the store, but also owned at some time until Lulu's death in 1971. That address was at 305 E. Liberty Street. 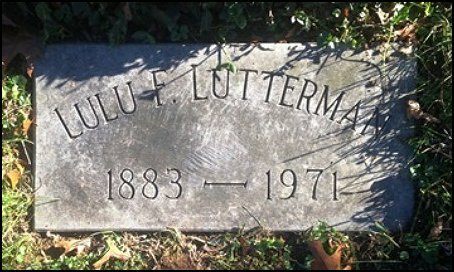 The Luttermans also owned a "camp" on the Little Miami River at a place known as "Tower Hill", which was just below Terrace Park (Read about it here). 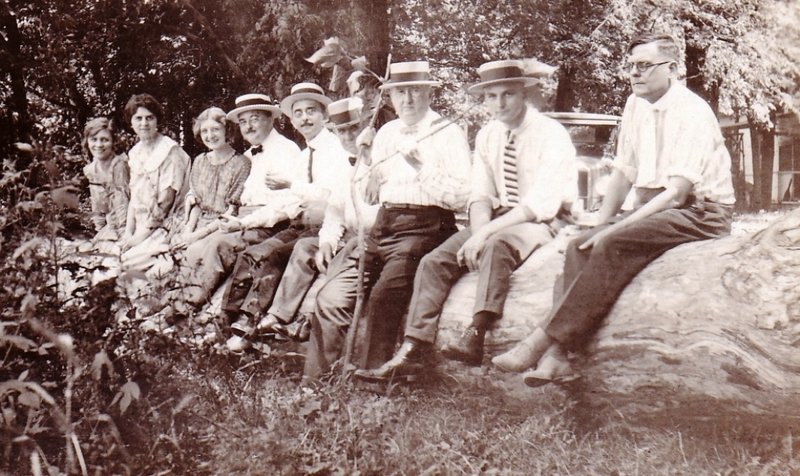 The Foertmeyer family was apparently invited out to the camp upon occasion, judging from photographs we have found showing the visits. 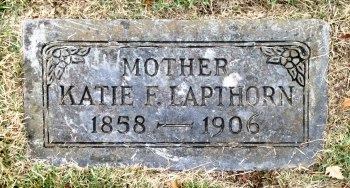 In 1918 Edna died in the flu epidemic, but apparently the friendship carried on between the families. Lulu ended her ownership of the camp in 1940, Louis having died in 1932, but most people vacated after the great flood of 1937 destroyed the recreational area and most of the camps. 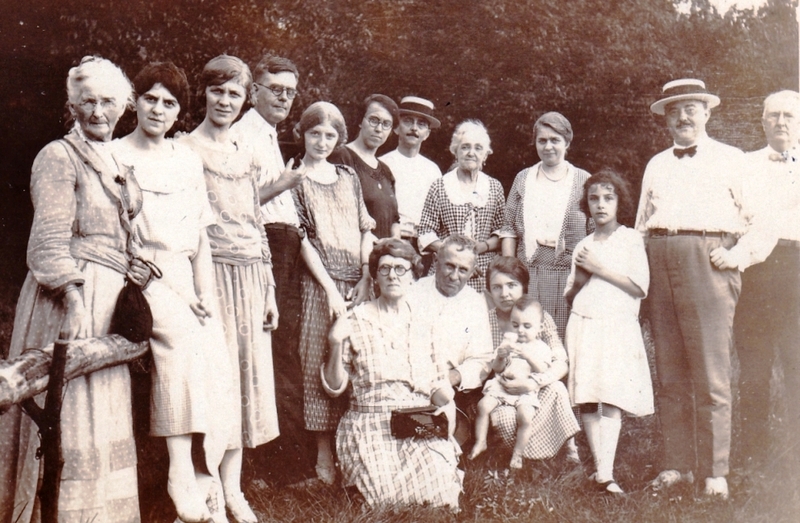 (L-R) Marie Mente Foertmeyer, Elsie Emerson, Berta Weiss, Fred Emerson, Blanche Emerson, Doris Buegel(? 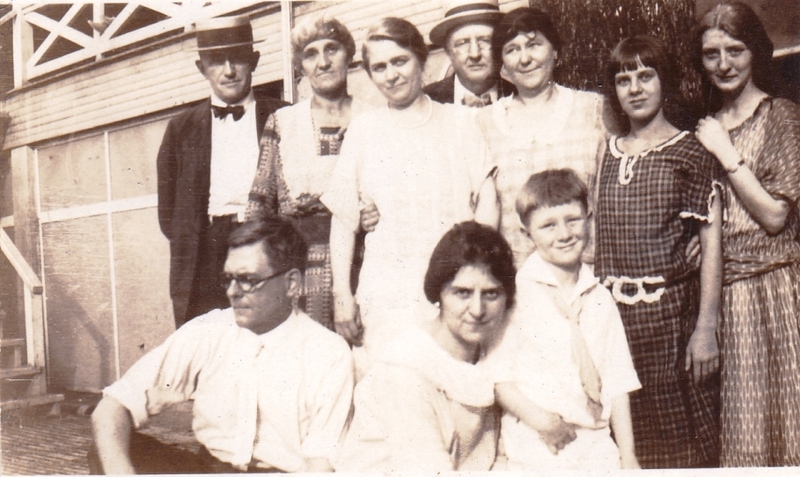 ), Louis Lutterman, Sarah Anderson Evans (Carrie Evans Foertmeyer's grandmother-William E,'s wife), Lulu Lutterman (formerly Edna's best friend), Ed Lutterman, Charles George Foertmeyer, Jessie Emerson (Fred's sister), Charles W. Evans (Sarah's husband), Carrie Evans Foertmeyer holding son Evans Foertmeyer, & Virginia Foertmeyer Jotter (William & Carrie's daughter). 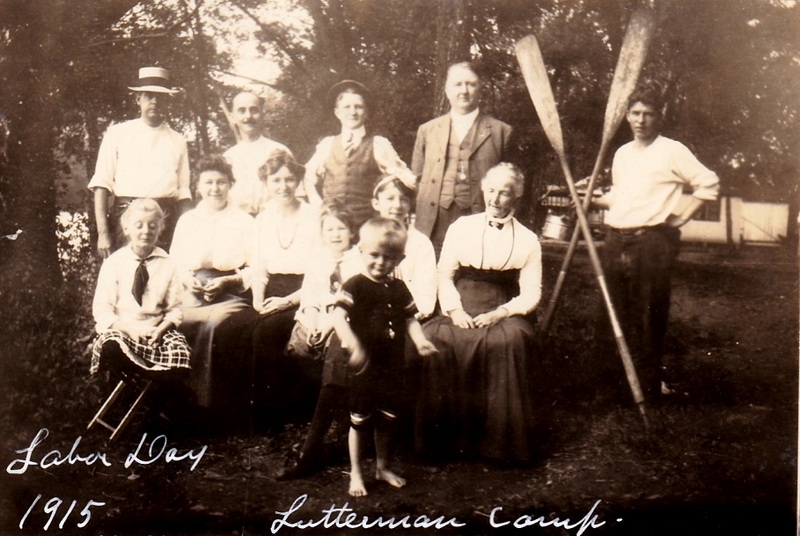 As was discussed before, Lulu and Louis Lutterman owned a river camp at Tower Hill on the Little Miami River. 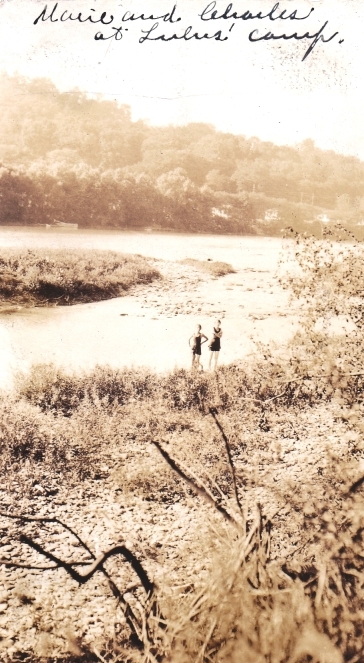 The photo to the left(c.1929) shows Charles H. Foertmeyer and his sister Marie Foertmeyer Knoblaugh standing on the bank of the Little Miami on Lulu's camp. Avoca Park is located between Terrace Park and Mariemont at 7949 Wooster Pike. The lagoon was formed by the water that had passed thru the Mill's turbine and had exited the mill (mill's tail race). Thanks to Tom Jesionowski, whose great grandparents were the ones who originally developed the park between 1878 and 1907 before selling, I now have more information. 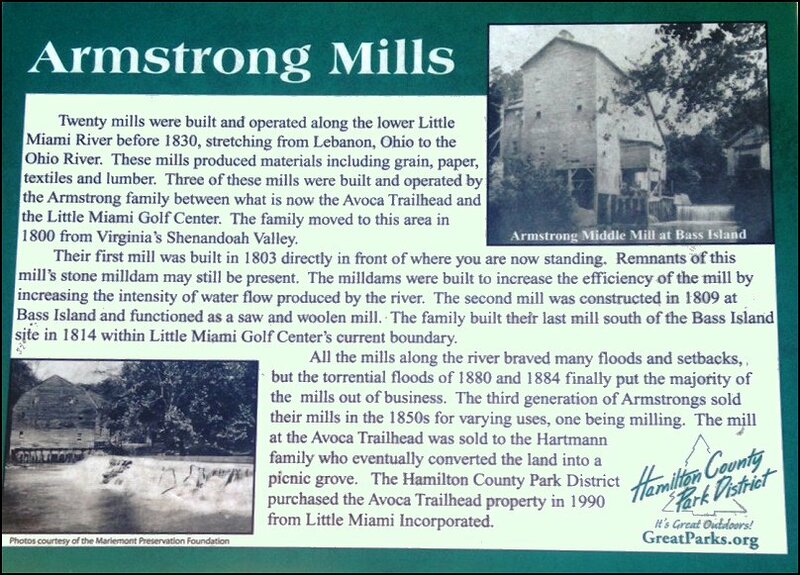 It was originally called Hartmann's Grove and the original mill was constructed in 1802 by Columbia Township pioneer Nathaniel Armstrong and is said to have been the second mill in the Miami Valley. Later mills not only ground grain but also were used to pull and card fiber. The photograph below shows the old Armstrong Upper Mill in 1907. 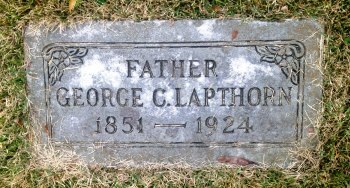 It was located in the Northeast part of Avoca Park across from where the Miami Bluff Apartments now stand. Standing in front of the building is (right to left) the mill owner John A. Hartmann, his nephew Ed Hartmann, and a unknown person (possibly the buyer in 1907). If you read the pdf file about the stretch of river between Terrace Park and Plainville (link above), then you know about the three mills the Armstrong brothers built here. They were the Upper Mill, Middle Mill, and Lower Mill. Shown above is the Upper Mill in 1907, which according to all accounts would have been just about across the river from Lulu's camp. Here we see the "lagoon" or mill pond created by the Upper Mill at what is now Avoca Park. The three mill ponds were what made this area (pre-airconditioning) inviting to city dwellers during the summer. Therefore, camps were purchased and built all up and down the river to take advantage of the ponds for swimming and canoeing... that is until the great flood of 1937, which knocked out the three dams creating them. After an extensive search Lulu's property was found showing she sold it in 1940. As seen above, the property apparently ran across the river to the far bank. Here you can see the location of the property in relation to its surrounding area. Here it is in an aerial photo taken in April 2015. 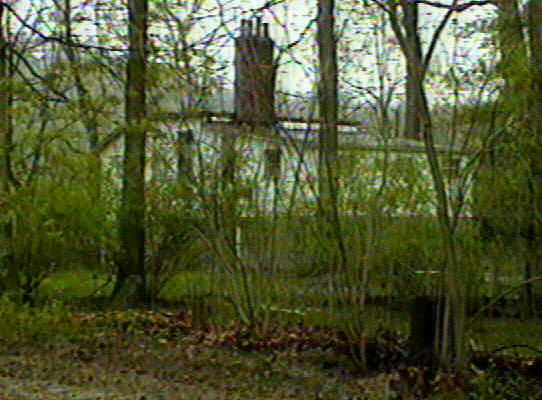 I haven't determined yet if that is the original house or not. Well, after a trip out to the property today, I am convinced that the house before described as Lulu's is indeed not. It is clearly marked on the wall of the house "4113 Pee Wee" (Riverside's other name). Lulu owned 4115, which would have been next door. This is according to Auditor's records. Neither 4115 or 4117 have buildings on them today, but then 4119 does have a home built in 1865. Also according to the auditor, 4113 was built in 1925. The green squares above are where I would assume the cottages had been. Going back to old photos on the Hamilton County Auditor's website, this is stated to be the former Lulu Lutterman Camp cottage. Upon a return to the property I was fortunate enough to run into the owner of 4119 and he told me that I was right about the location of Lulu's cottage at 4115, and that when Little Miami Inc. bought the lot they came in and removed every trace of the cottage. 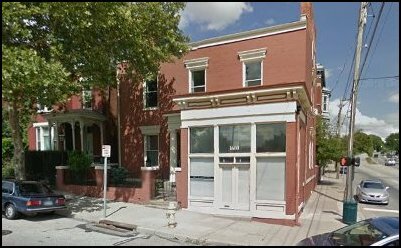 Properties 4115 & 4117 are now owned by Little Miami Inc. The red square is the Lutterman cottage. across the river, took a beating in the 1937 flood.